Il ristorante si trova in un palazzo nobiliare a pochi metri da Piazza Maggiore, di fronte alla cattedrale di San Pietro. 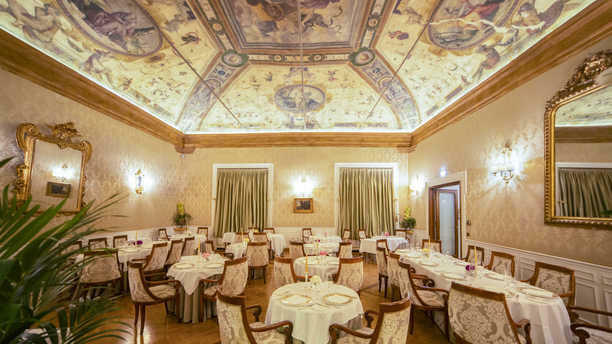 Parte del Grand Hotel Majestic, nella grande stanza affrescata dalla scuola dei Carracci sono elegantemente apparecchiati i tavoli, grandi vasi di fiori freschi in un ambiente che ci porta subito con la mente ai primi del’900 quando queste stanze vennero trasformate in hotel di lusso. Da meno di un anno guida la cucina lo chef Cristian Mometti, lunga esperienza nell’alta cucina, grande rispetto per gli ingredienti, sempre alla ricerca della massima qualità e di tecniche innovative. In carta sia un menù creativo che quello della tradizione che vuole rievocare le tavole della festa delle famiglie nobili bolognesi con ricette originali e proposte di una tipicità non scontata. Le nuove formule di proposta come il gran carrello dei bolliti o il pranzo della domenica sono il frutto della ricerca dello chef Mometti per una cucina tradizionale di qualità ed eleganza uniche. Sunday lunch, Had Bollito Misto with the typical 7 meat cuts accompanied by different sauces and 3 side dishes. Generous portions. Scenic restaurant with wonderful ceiling frescoes. r 20th anniversary meal. We were made to feel special from the moment we arrived. The 5 course local cuisine tasting menu was superb and the sommeliers wine choice excellent. Expensive but worth every penny. The service was impeccable. The food was cooked to perfection. My wife’s dish was more spicy than expected so we switched plates and it worked out just fine. If you want to be top , you first need to be top in what you serve. Beautiful surroundings and an interesting menu. We went for the Emilia set meal which was good in parts (the starter and dessert particularly). The mains of pasta and veal were rather ordinary considering the price. Wine generally good - go for the local wines like the Sangiovese. We complained as done if the squid was tough and we couldn’t cut through. The prawn starter contained something wrapped in a light batter. It tasted vile and turned out to be a prawn head, including Brain with shell on wrapped in batter! Why is that on the menu? It was completely out of place! The grandeur of the place is wonderful. Really nice atmosphere for a special day. Sensational 5* restaurant with excellent service. With any restaurant of this quality you are going to pay for it but it was totally worth it. Beautiful atmosphere, excellent service, good choice of wine but a food of poor quality. We had 5 plates, 4 of them were poor, cold when it was supposed to be warm, a fish that I had to cut with the knife and energy, an overcooked sauce with pork cheek that should have been more tender. Very low attention to the colours. A big deception. On a positive starting note, the dining room is beautiful and we received a warm welcome. We were the first guests. There were two big negatives during our dining experience. First is we waited one hour for our first course. My wife and I were hungry and chewing on the bread. Not sure why it took so long considering the restaurant was empty when we arrived and only two other tables occupied 30 minutes later. It was also disturbing to see one of the other tables receive their first courses the same time as us and they arrived about 30 minutes later! Maybe the kitchen just forgot about our order. The second big negative was my wife and I both ordered the tagliatelle ragout. The dish was a disaster for both of us. The meat was bland lacking any sauce and added nothing to the tagliatelle which was decent. The dish was difficult to eat. I raised my concerns to the head waiter. There were apologies but that did not make up for a very disappointing evening. We skipped dessert and left. We won't return.